Swansea Bay Business Club has finished its 2018 networking season with another busy event at the Marriott Hotel in Swansea as members and their guests attended the final networking event of the year. Welsh favourite, entertainer and entrepreneur Stifyn Parri attended the lunch at the Marriott as guest speaker and spoke to guests about his career in the entertainment and creative industries, providing plenty of laughs along the way. 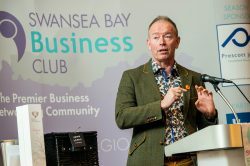 Stifyn joins a long list of high calibre speakers provided by Swansea Bay Business Club in 2018, something that the club intends to continue throughout 2019. Swansea Bay Business Club President, Paul Gardner, commented: “Our Christmas lunch was a fitting end to a year that’s been full of highlights and top-quality speakers, including appearances from Jonathan Davies OBE, Stephen Kinnock MP and Cerys Furlong to name just a few. We have also provided our members and guests the opportunity to attend private events such as our talk with the company behind the Tidal Lagoon project where guests heard first-hand about the current situation and what the future plans for the project might look like. We were also delighted to host the The Bank of England Agency for Wales’ November Inflation Report Briefing in Swansea. 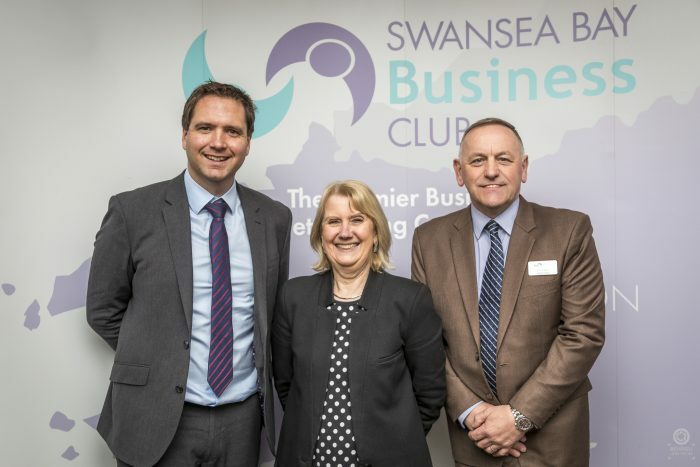 2019 will mark 70 years since Swansea Bay Business Club was founded and there are already firm plans in place to celebrate this ‘birthday’ throughout the year. Paul continued: “We have some big plans for 2019 including aiming to attract 70 new members to mark our 70thyear and celebrating with a huge birthday party style event during the networking season. “We will continue to provide our members and their guests with the highest calibre speakers from the business community as well as political figures and celebrities to ensure we host a wide range of events that encompass all of the things our members and their guests value, namely; first-hand advice from highly successful businessmen and women, political insight and entertainment. Swansea Bay Business Club will now take a break before re-launching its 2019 networking season, once again at the Marriott Hotel in Swansea. The event will take place on Friday February 1 with guests asked to arrive from 12:15 for a 1pm lunch.